As I have already mentioned in my ”Adventurer's confession”, I have loved nature ever since I was a little boy. While travelling and photographing tribal peoples and wildlife I have had many amazing experiences, but I have also seen things which made me feel immensely sad. I would like to present some of these observations here, in the hope that if enough people try to understand, something might change. The small Sumatran village of Kersik Tua lies just south of the equator, on the edge of the largest national park in Sumatra - Kerinci Seblat. Because the elevation is 1300 meters above sea level, mornings can be pretty cold. It is 6am and we are walking along the main road through the village. Most shops are already open and advertising their goods outside, mostly bags of synthetic fertilisers and pesticides. We take a gravel road towards the slopes of Sumatra's highest volcano Gunung Kerinci (3805m). Villagers are overtaking us on their motorbikes, and a bit later we see them already at work - spraying their vegetable fields with generous amounts of chemicals, they are covered in plastic raincoats and have chemical masks on their faces. We have reached a big sign announcing that here is the official border of Taman Nacional Kerinci Seblat – a national park famous for its rare bird-life, with 17 species of birds endemic to this unique environment, which can be found nowhere else in the world. But all around there are just fields! Before we finally reach the edge of the forest, we still have to traverse yet another vegetable field. Huge forest trees are lying dead and half burnt among the cabbages. Just two years ago there was still a primary jungle here! In less than two years, a few kilometres of primary rain-forest inside the national park have disappeared! It starts to rain in the early afternoon, as it does almost every day in this part of the world, so the poisons sprayed over the fields this morning are quietly washing down into the streams and rivers. Endangered birds are happily feeding on poisoned insect, accumulating the pesticides in their bodies, if they do not die right away. Not to mention that everyone and everything else living downstream is drinking the same water. Not long ago, Africa was beautiful and wild, full of animals. Nowadays little of it remains. In South Africa, for example, there is hardly any nature left outside the national parks. I found very interesting, for instance, the problematic of elephants in Kruger NP, the largest and most famous park of South Africa. Despite its vastness (it is about 350 kilometres long north to south with an average width of about 50 kilometres) it's far from true wilderness. Among other things, the park management established permanent waterholes with water pumped in throughout the year. The aim is to keep animals close to the tourist routes. But the year-round presence of the water in Kruger disrupted the natural migration of elephants, who until recently moved seasonally to adjacent parks in Zimbabwe and Mozambique. Now they've lost the need to migrate (but also can't anymore, because there are now fences in their way) and they stay for the pleasure and joy of the tourists. However, this caused an increase and higher concentration of elephant numbers leading to a subsequent destruction of vegetation which now has no time to regenerate. In search of the central African wilderness we travelled all through south and southeast Cameroon and southwest of the Central African Republic. The most common ’animal’ to be seen, however, was a modern logging truck loaded with the enormous trunks of giant forest trees. They were often so large that a truck could only carry one trunk. We met dozens of them every day, on roads which don't exist on five year old maps ... And so the last African wilderness is dying. We felt like crying. Few people probably realise that those magnificent forest trees have to pay for, among other things, hundreds of new trucks (which must be renewed often because roads are unpaved and damaged by heavy traffic) and also for the very expensive construction of thousands of kilometres of roads. 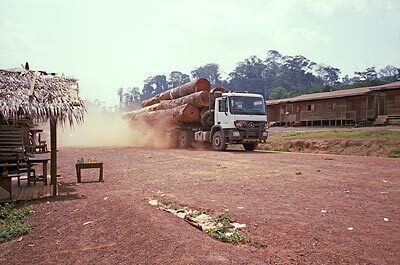 Then there are millions of gallons of fuel needed for their transport; the trees are often carried for over 600 kilometres from the northern Congo to the port in Cameroon, one or two trunks per truck. Add to this the costs of logging itself and all the people involved, and still somewhere there is some Chinese businessman (or two) getting incredibly rich from it ..... And so far we only got to the Cameroonian port. Europe, America or Japan is still far away. In the end someone pays for it all, though. And the African rain forest with its animals is quietly and sadly disappearing forever, paying for human recklessness and greed.